A recent report examining retail shrink rates around the globe has offered new insights on theft and shrink-related issues in 14 key markets. The full 66-page report makes for an interesting read, but if you're short on time, we've summarised the key takeaways for you below. Commissioned by Tyco Retail Solutions and conducted by PlanetRetail RNG, the study was a big one: it surveyed more than 1,120 respondents operating more than 229,000 stores from countries representing the world’s largest economies. The headline figures they found were pretty stark: according to the report, shrink cost retailers USD$99.56 billion globally. In more concrete financial terms, that makes retail crime the 63rd largest economy in the world by GDP, just ahead of Morocco. Or in more splashy terms, it’s enough to pay off the entire UK budget deficit and buy every NFL football team with change left over. But perhaps most interesting were the disproportionally high-value figures for the United States. Despite having a shrink rate broadly in-line with other global markets (1.85% of revenue for the US, compared to 1.82% globally), retail theft in the US accounted for more than $42 billion in value—approaching half of the global total. This was vastly higher than any other nation, especially compared to China in second place at $13.52B and the UK at $7.45B. Accounting for 51.5 percent of all losses, shoplifting and external theft is the number one source of loss for US retailers. Return fraud came in second at 26 percent of external shrink cases, and ORC ranked third at 20 percent. The study also found that ORC pays better in the US than elsewhere globally. 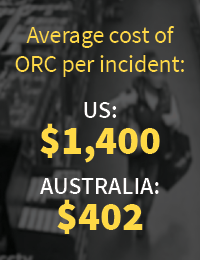 The average value of each ORC incident was more than $1,400 — significantly higher than the value of ORC thefts in other markets like Australia ($402 average per incident). High rates of theft committed by highly incentivised criminals is not a recipe for success. But the challenge for US retailers is also greater than anywhere else due to the simple mechanics of the market. The US has more stores per capita than most other countries, and store footprints are larger, making it easier for thieves to operate. Coupled with the availability on new online marketplaces to fence goods directly, and it’s easier than ever for ORC gangs to dispose of goods. But retailers are also working on ways to fight back. More retailers are starting to use cloud-based tools to analyse shrink and deploy resources to areas where ORC crime is spiking. Facial recognition technology was the least-used loss prevention tool for US retailers, followed by RFID and public-view monitors. No matter what country you’re in, the challenges of Loss Prevention are universal. Putting the numbers to the scale and scope of the challenge help us all understand the resources that will be required to affect change. The entire report is available as a free download from Sensormatic here.